In December we were back in India with Covestro for the last two events of our STEM Festival! First, we hosted an event in Goa on December 4 and 5, welcoming more than 400 girls. 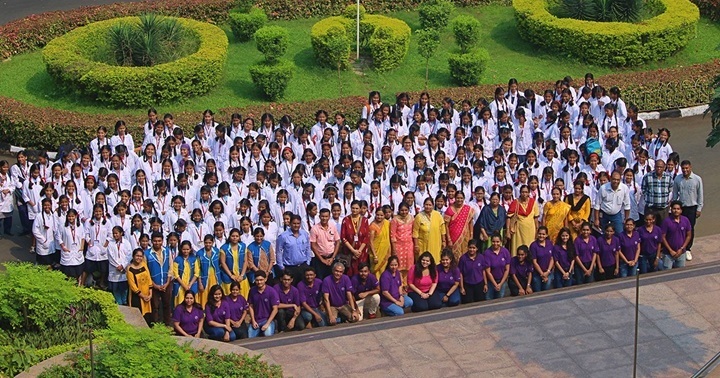 Then, on December 14 and 15 we went to Nagpur to meet more than 350 girls. We taught workshops in several languages and showed the girls how STEM is part of their everyday lives. To read everything we have done with Covestro in India, click here! On December 8, we joined forces with Stanley Black & Decker for our first g4g @work in Damparis, France! 30 kids got the opportunity to come to the SBD premises in Damparis and explore fun, interactive workshops. They unlocked their creativity while making their own sculptures using chocolate, they were amazed when they managed to extract their own DNA, they enjoyed learning about circuitry while building their own drawing robots, and they had lots of fun testing both their own strength… and that of the SBD tools! A massive thanks to the wonderful welcoming teams of SBD and to the 10 volunteers of the day! Check out the facebook album of the day here! On December 12, we were thrilled to host our first g4g @work in Madrid with Nokia! We welcomed 100 curious girls aged 10-15 and had a blast exploring all the fun aspects of STEM. The big hits of the day? Crafting their own explosive bath bombs, learning about plasma physics and fruit batteries, being amazed by Nokia technologies and competing at Pictionary… in Virtual Reality! What an amazing experience! A massive thanks to our guest speakers of the day, Francisco Polo, State Secretary for the digital matters and Alicia Richart, General Director of digitalES, and to all the 40 volunteers for helping this day come to life! Have a look at all our photos here! On December 15 we hosted our last Makerspace of the year in our lovely atelier in Brussels. We made the most out of innovation, smart homes, and… delicious ingredients! Each of our 20 students of the day had the chance to make their own edible home, full of sustainability inventions and creative thinking. Browse through our photos on the left! Finally, we kicked-off 2019 by presenting STEM activities to the British Junior Academy of Brussels on January 10 and 11 in front of 80+ kids for their STEM week. Lava lamps, polymer worms, elephant toothpaste, magic milk, DNA experiments, bath bombs… all of which were quite popular with these curious minds and eyes! In the upcoming two decades, India may have one of the youngest and largest working-age population in the world. But despite many positive shifts, education for some girls in India remains a challenge and is still below the world average. And when we look to the take-up of STEM careers when education isn’t a barrier, the Economic Forum Report show that in India only 14.3% of researchers in science are women. 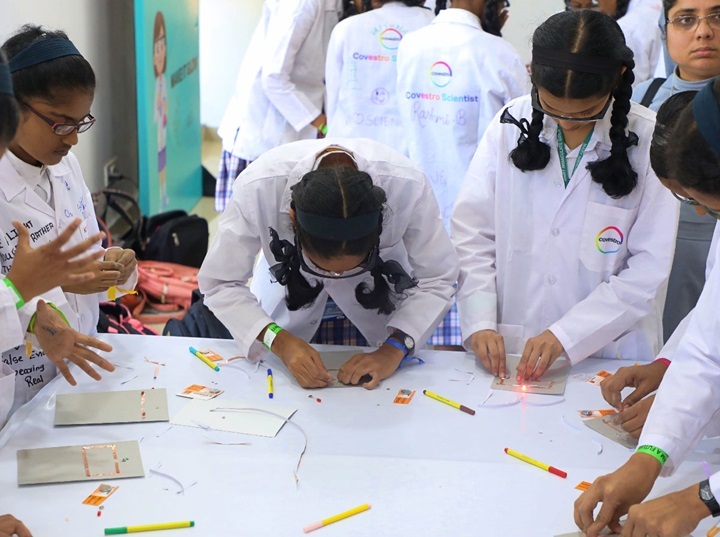 With the help of great partners and an enthusiastic g4g community in India, we are working together to see how greenlight for girls can do more to make a difference for girls to have access to higher education and be encouraged to continue their pursuit towards STEM opportunities. As we say with everything we do, it always starts with one person, one group or even one company that says – let’s start! For 2018, they proposed to collaborate on a STEM festival in India with the Covestro team, the ChandraMohan Foundation, the Nehru Science Centre (Ministry of Culture, Gvnmt of India) and g4g – and we loved the idea! After the team’s incredible dedicated work, we are all proud to have reached more than 3000 girls in 6 cities, delivered full days of STEM workshops in 5 languages (Hindi, Marathi, Malayalam, Gujarati and English), over 3 months! 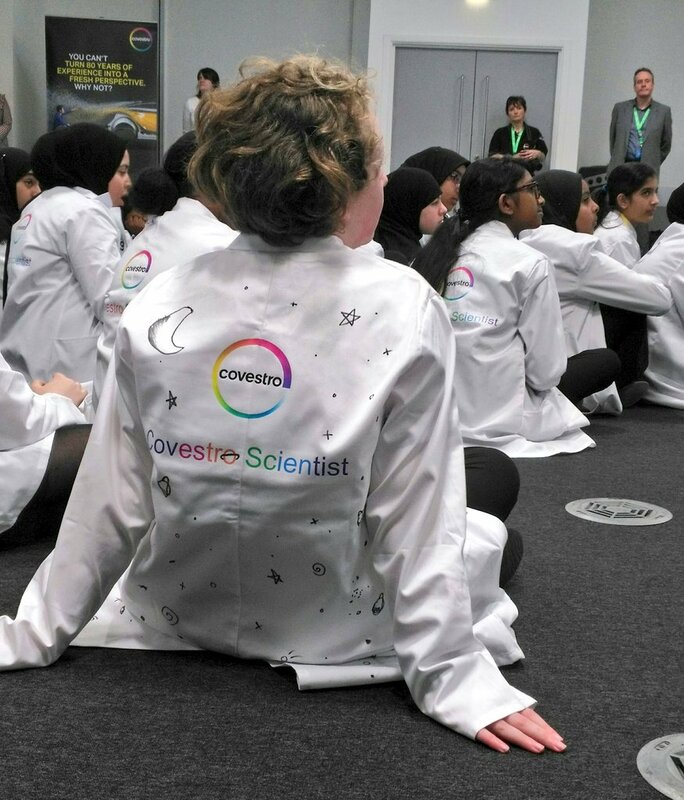 These special girls, coming from such a diverse background, had the wonderful chance to be inspired by incredible guest speakers and role models and to learn first-hand about science from the Covestro team. Between October 8-13 we went to Mumbai and met with more than 1200 girls curious and eager to discover all the fun in science. 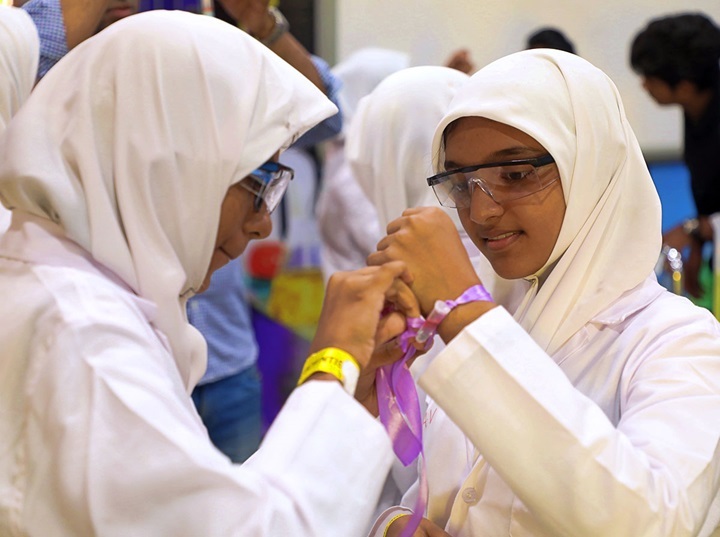 Between November 7-9 it was in Calicut that we inspired more than 370 girls to pursue STEM careers. Our third event was in Noida, between November 21-24 and we invited more than 430 girls to join us for a full free day of science discoveries! 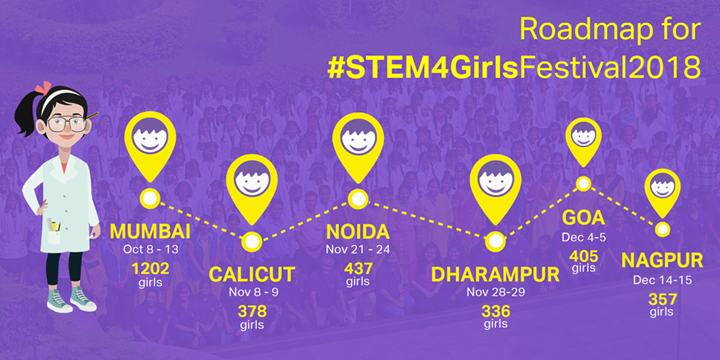 In Dharampur, between November 28 and 29, we met with 335 girls curious to learn all the exciting secrets of STEM. Then, we hosted an event in Goa on December 4 and 5, welcoming more than 400 girls. Finally, on December 14 and 15 we went to Nagpur to meet more than 400 girls. All the events started with a motivational session from popular women scientists who shared their experiences of being in this field. This was followed by hands-on fun experiments with 30 girls in one workshop and 3 workshops throughout the day. The experiments were about making a simple circuit, creating a polymer putty and extracting Human DNA. In the MakeItGlow workshop, students were taught to make a simple circuit in using copper tape, lithium battery and a LED. The Polymer Putty workshop involved mixing two compounds or polymers that react with each other to form a completely new polymer. In the Human DNA workshop, the students studied the structure and composition of the human DNA and got an opportunity to extract their own DNA. Mumbai was our first step for this festival. And what a step… With more than 1200 girls and 10 truly inspiring guest speakers, it was an exciting couple of days for the girls, who seemed genuinely curious and inquisitive about what they were being taught in the workshops. Ms. Harpreet, who shared her journey of becoming the first woman pilot with Air India, and who showed the girls how science involves a dash of creativity and is incomplete without it! Dr. Surekha Zingde who illustrated her speech with amazing stories of prominent Indian women achievers in the field of STEM, starting from Dr. Anandibai Joshee (the first woman doctor to practise western medicine in the 1800s) to present day achievers. On Oct. 11, during the United Nations International Day of the Girl Child, which theme for this year was “With Her: A Skilled GirlForce”, when all our female volunteers had an amazing mentoring session with the girls. The fact that the sessions were displayed in both Hindi and Marathi, so everyone could feel involved and concerned. When our talented girls improvised a dance performance at the end of the last day, taught a few dance steps to the audience and we had the entire auditorium grooving! Calicut, also known as Kozhikode, is a coastal city in the southern Indian state of Kerala. This was our second stop for our #STEM4GirlsFestival2018, where we engaged 378 young girl students of different economic backgrounds from 13 schools over two days. Interacting with students from Kerala, India’s first state to achieve 100% literacy was quite a humbling experience. The energy and enthusiasm of all these girls, that our first guest speaker of the day couldn’t help but notice and applaud! When Mr. Manash Bagchi from the Regional Science Centre invited the girls, teachers and volunteers to the opening of the Genomics Hall for the National Institute of Biomedical Genomics, which was since inaugurated by the Nobel laureate Harold Varmus on 11th November 2018. When Dr. T.R Resmi, Scientist & Head in charge, Isotope Hydrology Division(CWRDM) had these inspirational words : “Think where you want to reach, the path will then form automatically” . Noida is the abbreviation for the ‘New Okhla Industrial Development Authority’, which is a systematically planned satellite city of Delhi. For our event, more than 400 girls, coming mostly from slum areas, braved the plummeting morning temperatures to join us at the Covestro factory. When Sunita Durrani shared her personal story with the girls. Coming from a small town in Jammu & Kashmir she recently made it to joining the World Health Organisation as a health care professional, working in marginalized communities to help eradicate Polio. The room, full of girls coming from less privileged areas, resonated with shared emotion that “girls can do anything once they've made up their mind”. For this event, girls were coming from a radius of 50 km where the event was held, particularly from several tribal hamlets. In Dharampur, which is a more rural area than the last three areas we had our events in, girls frequently help their families in the farms in addition to going to school (that are usually very far away from their homes). Education is considered important, but helping their family and growing food is vital. When Dr. Kusumben Rawal, the Gynecologist who started the first maternity hospital in Dharampur, spoke about women empowerment, a topic very close to her heart. When Aparna Kadikar, Architect and Social Worker, talked about her journey of being the only girl in her class at the architecture college to setting up Kedi, an alternative education school nearby. When Swati Bedekar talked about menstruation and explained the physiology behind it and thus, dispelling the myths around it. Our two days in Goa, known for its beautiful beaches with swaying palm fronds, intriguing vernacular architecture and coastal cuisine, were memorable where we reached out to 405 girls from 20 schools. When Dr. Siby Kurien, Principal Scientist, CSIR - National Institute of Oceanography (NIO) opened doors to the girls by presenting to them a subject they didn’t know anything about : Oceanography. When KR Anupama concluded the day with a very heart touching speech, telling the girls they need to be themselves, be assertive, listen and act on constructive criticism… while talking about Hermione Granger (which struck a chord with all the students!). As a professor in the Department of Electrical & Electronics Engineering, BITS Pilani KK Birla Goa Campus, she often encounters a gender skew in favour of boys in any class. For the last event of our Science Festival with Covestro, the STEM4GirlsFestival2018, we stopped in Nagpur, in the geographical center of India. The delight and the smile on the 357 faces after they succeeded in the experiment, reminded us why we planned this festival. 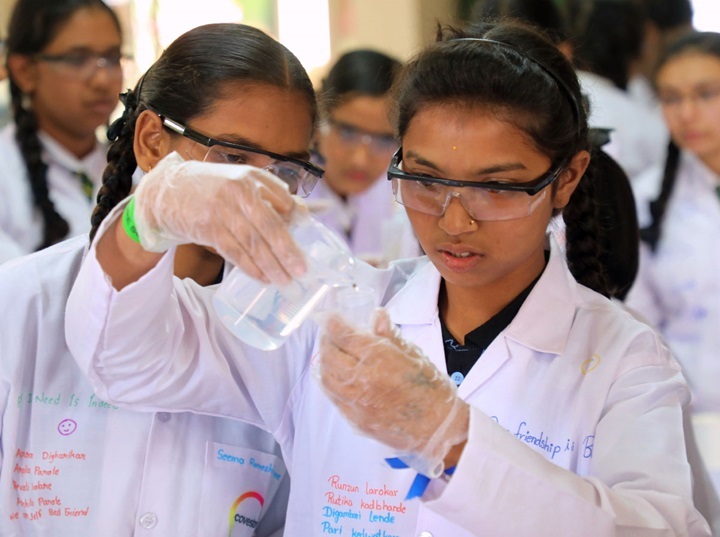 When Dr. Jyotsna Meshram introduced students to the basics of Green Chemistry and encouraged the girls to accept challenges as stepping stones to the future. When Mrs. Kanchan Gadkari, social worker, paid tribute to all the great women who made India’s history - warriors, academics, politics. What a festival… Watch the video recap below and have a look at our photos album here! Devanshi Dwivedi, Trustee, Chandra Mohan Foundation. Dr. Anitha A B, Executive Director & Principal Scientist, Centre for Water Resources Development and Management (CWRDM). Swati Bedekar. She talked about menstruation and explained the physiology behind it and thus, dispelling the myths around it. MUMBAI = Valiram Bherumal Melwani Model High School (Grant Road), Lokmanya Tilak English High School (Mulund), Udayachal High School (Vikhroli) and H.A. & L.S. Girls High School (Mira Road), Lokmanya Tilak English High School, Mulund; Shiv Shikshan Sanstha's English Medium School, Sion; Euro School, Airoli; Chikitsak Samuh Shirolkar High School, Girgaon and Sharadashram Girls Technical School, Dadar, Bai RFD Panday Girls High School, Children’s Academy Ashok Nagar, S.M. Shetty High School & Junior College, Smt. Ramdevi Sobhraj Bajaj Arya Vidya Mandir, Taiyebiyah Girls High School, Arya Vidya Mandir and SEAL Foundation, Karmveer Bhaurao Patil Vidyalaya, Guru Nanak High School, Nabar Guruji Vidyalaya, Balmohan Vidyamandir and ICL High School, Saraswati Vidyalaya Semi English School, Saraswati Vidyalaya Marathi medium School, Gopinath Patil Jr. College, Bhimadri Vidyalaya, Saraswati Madhyamik Vidyalaya and Janata High School, NES National Public School, Ram Ratna International School, The Cathedral and John Connon School, ICL MON-AMI School, Maulana Azad High School and Muljibhai Mehta International School. CALICUT = Bhartiya Vidya Bhavan, Chevayur, Government Girls HSS, Balussery, Presentation HSS, Chevayur, Bhartiya Vidya Bhavan, Perumthiruthy, Calicut Girls HSS .Amrita Vidyalayam, Government Ganapath Vocational HSS, Feroke, Government HSS, Azchavattom, St. Michels Girls High School, Providence Girls HSS, BEM Girls HSS, GVHSS Nadakkavu and St.Vincent's Colony Girls High School. NOIDA = Father Agnel School, Vedic Kanya Inter College Dadri, M.C Gopichand, DAV Girls, Navjeevan Intercollege, Nehru Smarak Inter College, KCS Girls Inter College, Shaheed Bhagat Singh Inter College, Noida Kanya Inter College and Chaudhary Keshram Inter College. DHARAMPUR = Shri Swaminarayan school, Ramwadi, Shri Majirajba Kanya Shala, S.M.S.M High School, Kharvel Prathamik Shala, B.R. International School, Bilpudi Prathamik Shala, Aasura Prathamik Shala, Vidyamandir Sherimaad, Ranpada Prathamik Shala, Vijay Rajmahal Road Prathamik Shala, Madhyamik Shala, Kharvel, Kedi School, Bamti Prathamik Shala, Bamti Ghogharbati Prathamik Shala, Radhaba Shamlal Patel Shala and Navinagri Prathamik Shala. GOA = Bal Bharti Vidya Mandir, Our Lady of the Rosary High School, The Rosary School, St. Theresa's High School, Santa Cruz High School, Mary Immaculate Girls High School,Government High School, A.J De Almeida High School, Mushtifund High School, St. Joseph Convent High School, Lourdes Convent High School, Shree Ram Vidya Mandir, G.S. Amonkar Vidya Mandir, Sacred Heart High School, Holy Cross High School, Mahila & Nutan English High School, Shree Ganesh High School, Bhatikar Model High School, Bethany Convent High School and Fatima Convent High School. NAGPUR: New Apostolic English High School, J.N. Tata Parsi Girls School, Smt. Dadibai Deshmukh Hindu Mulinchi Shala, St. Ursula Girls High School, Saraswati Tiwari Hindi Girls High School, Shri. Rajendra High School, Yashoda High School, Siddheshwar Vidyalaya, MSB Education School, Bhide Girls School, Nagar Parishad School Kalmeshwar, Surendra Garh NMC School, Jeevan Vikas Vanita, Lokanchi Shala, Jindal Vidya Mandir Kalmeshwar JSW and Pt. Bachharaj Vyas Vidyalaya. Hello there, I am Blakeley! I recently joined g4g as a student ambassador, and I’m very excited to work with greenlight in the future! I hope to help lead US-based events and serve as an example for young girls interested in science. I love being able to explore the world around me, and I find it fascinating how every scientific question can be approached as a puzzle. 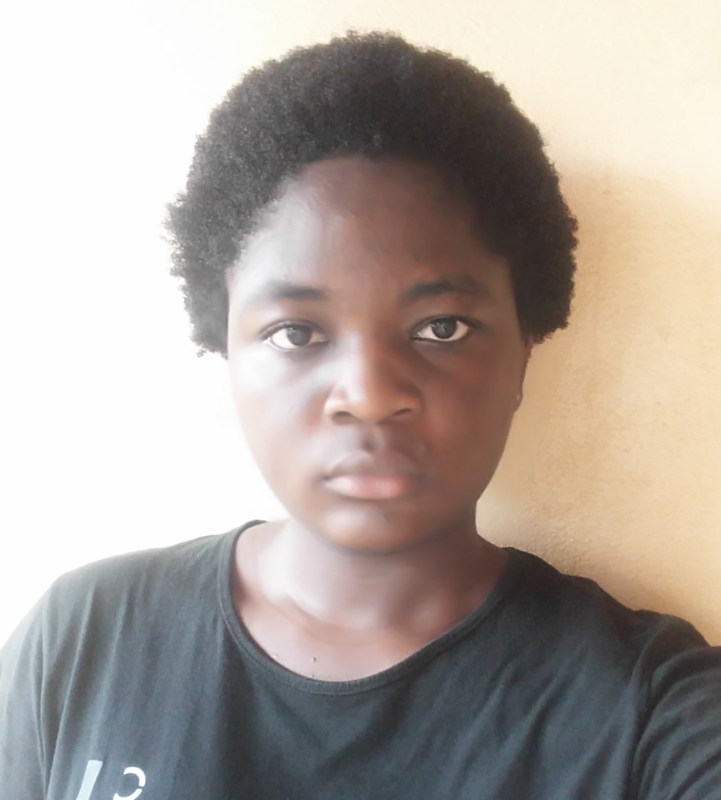 From coding to chemistry, I love testing different theories and eventually arriving at a conclusion through trial and error. 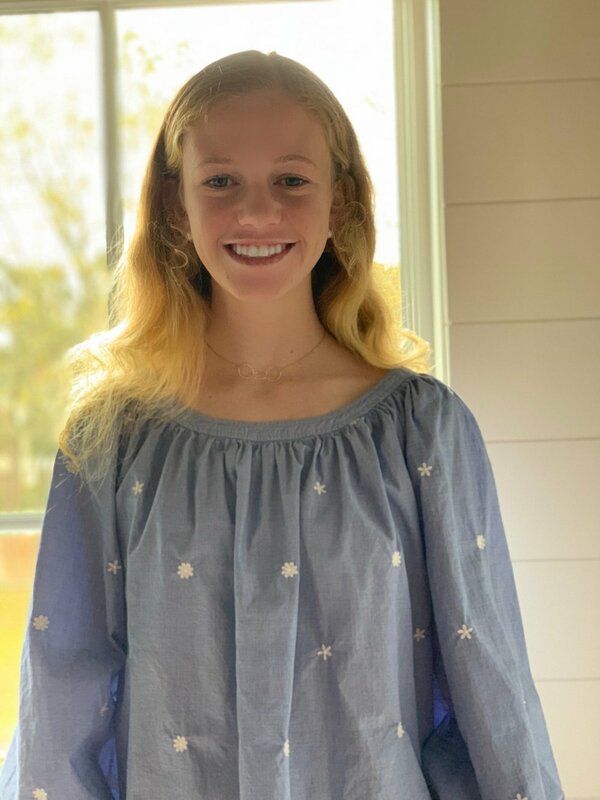 I think that an understanding of science, technology, and engineering is so important in the modern age, and I would love to pursue a STEM-based career in the future. At greenlight for girls, I am an Ambassador. Ambassadors help promote STEM awareness and lead events in their communities! I’m responsible for supporting g4g projects, along with introducing students to STEM-based fields of study and offering opportunities to explore science. I decided to join g4g after reading a news article about a greenlight for girls event at the NASA Space Center in Houston, and the event looked like so much fun that I immediately wanted to get involved with g4g! I lead a STEM Club for Girls at my school, and I was looking for additional ways to encourage younger students to pursue a potential career in science and technology. I love g4g’s mission and I’m so excited to be a part of such an amazing organization. This month, I wanted to share with you a fascinating article about an engineer responsible for designing and programming the robotic arm on NASA’s most recent spacecraft. Ollenu’s arm is tasked with placing crucial scientific instruments on Mars’ surface, and through his work, many scientists will soon be able to examine data from millions of kilometers away. Beyond his work, Ollennu runs hands-on robotics workshops and competitions in his home country, Ghana, and he encourages the next generation of scientists to pursue their passions. Our greenlight girls are absolutely incredible – strong, intelligent, and curious young girls, and we never fail to be impressed by their determination and capability to see a future full of possibilities. 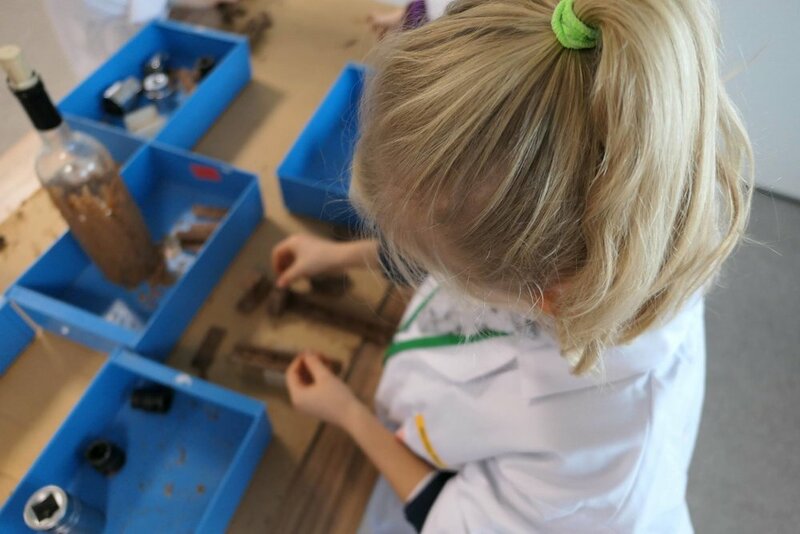 Recently, we've had such fun seeing silly scientists, innovative engineers, resourceful technicians, and more emerge as the girls get messy with hands-on and interactive workshops and activities. And we consider ourselves really lucky, because in only one month it’s 1500 girls that we met. Yes, 1500 in 1 month; it’s like meeting 50 energetic and enthusiastic kids per DAY! Pfew! This month, we went from Brussels to NYC, to Mexico, to India (three times! ), to New Jersey, to China, to Russia and back to Belgium again… Ready to read all about it? On November 3, our three amazing volunteers of the day (hello, Jelena, Thais and Alexaundra) gathered in Towson, MD, USA for a new g4g in the community w/ SBD! Once again, we joined forces with Stanley Black & Decker for the 2nd annual International Girls Day at their HQ in Maryland. 60 girls came and explored all the fun in STEM, they built bristlebots able to draw, extracted their DNA to put it in a necklace, or event, discovered the secrets behind slime! Check out our facebook album to see all the photos taken this day! 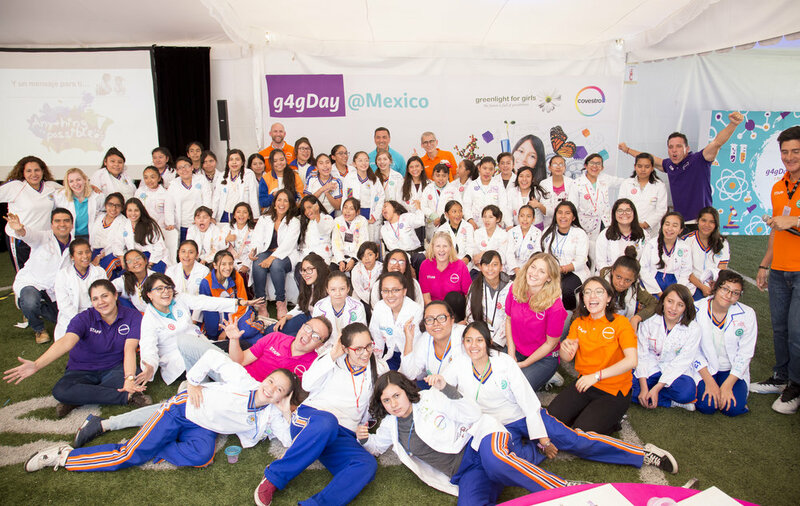 On November 7, you would have found Alex and Loredana in Mexico for our first g4g Day @Mexico City w/ Covestro! 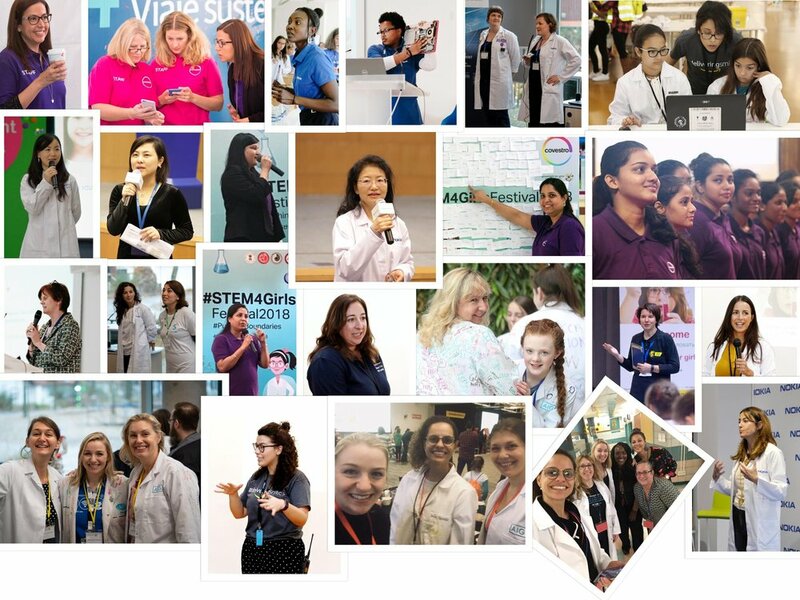 65 girls and 20 volunteers joined to the facilities of Covestro for a unique opportunity to see an insider's look into a day in the life of a polymer chemist as they tested out polymer worms, coding, DNA extraction, and engineer paper planes with their sustainable wish for the future on it. Girls were amazed to discover all the different things that we could do with chemistry and they also shared with us that the focus on sustainability inspired them to build a brighter and greener world. Wow! On November 9, it’s in the US again that Alex and our 20 volunteers of the day brought STEMtastic workshops for the second g4g Day @Jackson Heights, NYC! During the day, more than 80 kids got to experience five of our fun and interactive workshops; from learning math and statistics with chocolate to discovering biology with DNA extractions, to chemistry with polymer worms, they all proved so inspired and determined! Don’t believe us? At the snap circuits, a group refused to move on to a different project until they got it… they spent nearly the entire workshop figuring out how a specific circuit worked. And guess what? They got it! That’s in New Jersey that Alex finished her American tour this Fall, with the first g4g Day @Nokia Bell Labs in New Providence (where the telephone was invented by A. G. Bell!) on November 13. A massive thanks to the 30 volunteers from Nokia who helped us during the day and who crafted amazing workshops showcasing Nokia technology and all the fun in STEM. 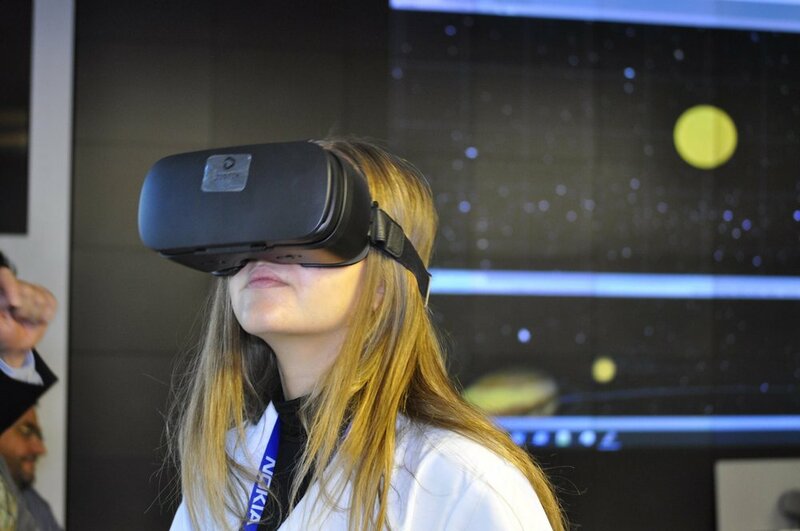 Our lucky 100 greenlight girls were the very first ones to test out the latest innovation from Nokia – the Virtual Factory! They got to be immersed in a virtual world where they tested robotic arms controlling robotics. They also visited the unique “Anechoic Chamber”, a room designed to completely absorb reflections of either sound or electromagnetic waves! As our event took place during Global Entrepreneurship Week, we even brought in a design-thinking activity where girls had to create businesses, inventions, and more to better their home, community, or school. Between November 17 and 18, you would have seen our inspiring g4g Founder & engineer, Melissa Rancourt, encourage nearly 200 girls in Shanghai and Hangzhou, China at the innovative facilities of Nokia, reminding them that science & technology is linked to absolutely everything around them and, especially, to any future career path they may choose. The girls loved exploring mathematics with chocolate, the chemical reaction of explosive bath bombs, and more as they became Nokia Certified Future Innovators in Technology! On November 24, our 9th annual g4g Day @Brussels took place at the International School of Brussels in our headquarter city. 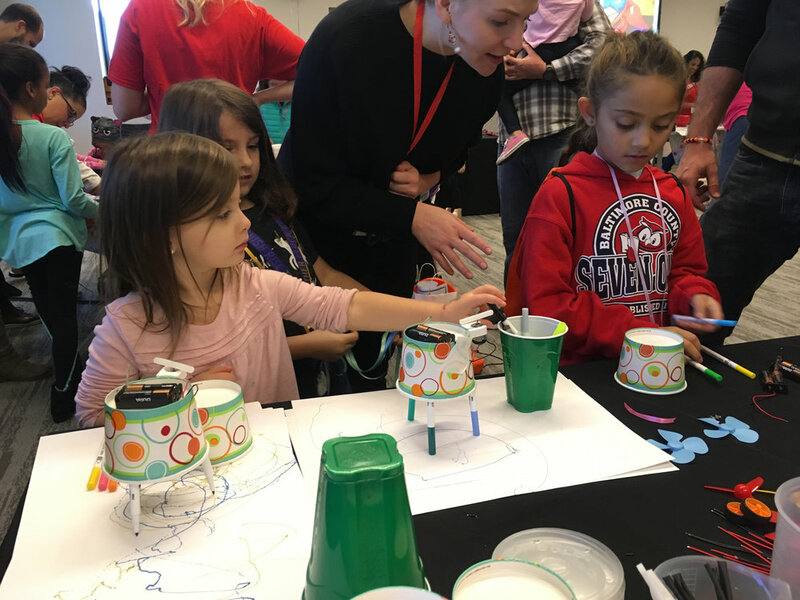 We welcomed 300 girls & over 75 volunteers from Belgium and the Netherlands to join us for a day of polymer cupcakes, robotics, lasers, the physics of Rubens' Flame Tube, invention with design thinking, fruit batteries, and more! Partners like Solvay, Nokia, Procter & Gamble, Baxter, Covestro, Stanley Black & Decker, and Muntpunt Library joined us – plus, a very special guest speaker.... Zora, the robot! She even managed to show off her dancing skills! Have a look at our facebook album here! On November 28, we partnered up with Stanley Black & Decker for the launch of our g4g Day @Khimki, Moscow! 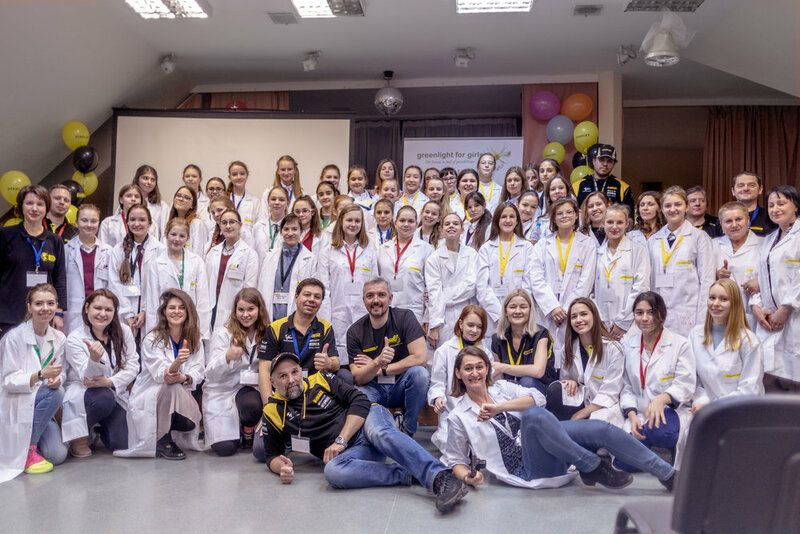 60 passionate girls came to one of the local schools in Moscow region to experiment STEM in all its forms. From chemistry with bath bomb to electrical engineering with drawing robots, to building frames and decorating them with laser with SBD tools, the girls, helped by 15 wonderful volunteers spent a brilliant afternoon, surrounded by hands-on science and fun learning! 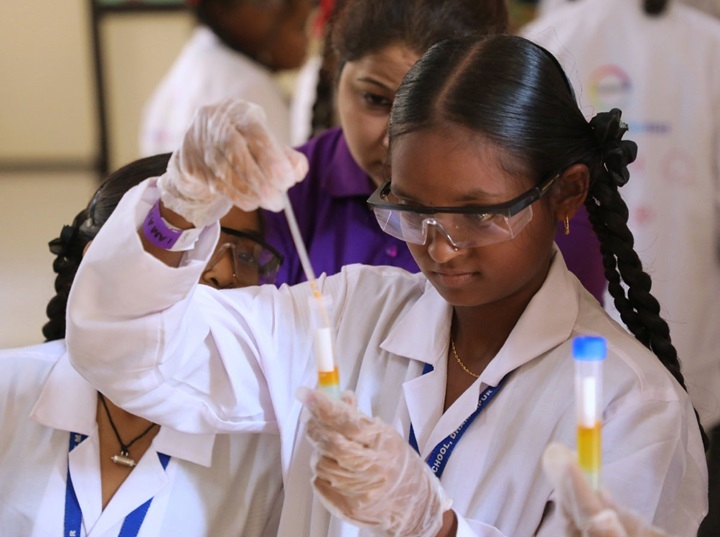 At the same time, and for the past few months already, we’ve been working in India to bring hands-on science and technology to over 2,700 girls thanks to an incredible global partner, Covestro, and along with the Nehru Science Centre & Chandra Mohan Foundation. 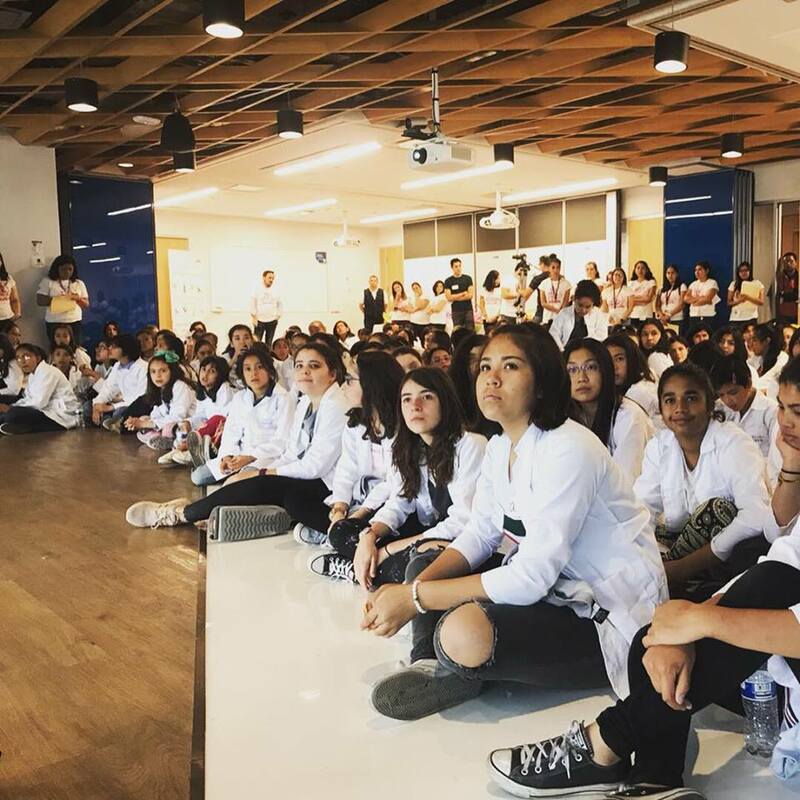 Girls had the chance to converse & hear from keynote speakers in both English and the local languages, and had the opportunity to try out polymer chemistry, bio-engineering with DNA, or electronics, where they created their own Vibrobots, design their own sustainable invention, and more. In November, we had events in Calicut between November 7-9, in Noida region between November 21-23, and finally, at the end of the month, in Dharmapur between Nov. 29 and 30… a total of more than 1170 girls reached and inspired in India this month: wow, another new record! Come back early January to read our blog post dedicated to this Indian journey and hear about all our upcoming projects in India!